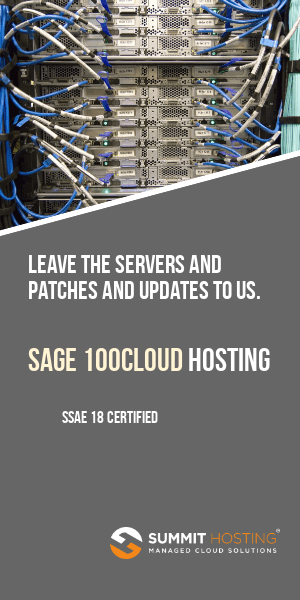 In What Order Should Sage 100 Modules Be Closed For The Month or Year? 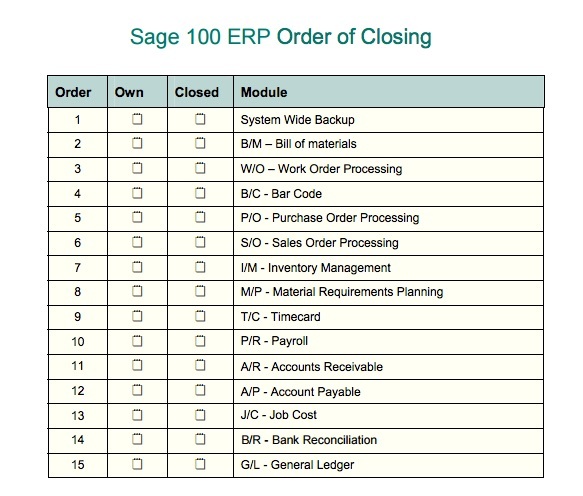 Curious about the order that you should close the individual modules in Sage 100? With year-end fast approaching, we’ve received several questions about which module to close first. The Payroll and Job Cost are especially time-sensitive to when they are closed since they continue to use “bucket driven” totalling (ie PTD, MTD, YTD, JTD) where the totals are accumulated based upon the current period shown in the module setup screen. Prior to closing, go through each of your modules and look in the Setup – [module name] Options. Review the amount of history that you’ve indicated should be retained. Unless you are experiencing slowdowns, we recommend retaining the maximum amount of history. Remember, history can always be purged – rarely brought back. Better to err on the side of retaining too much information than not enough. 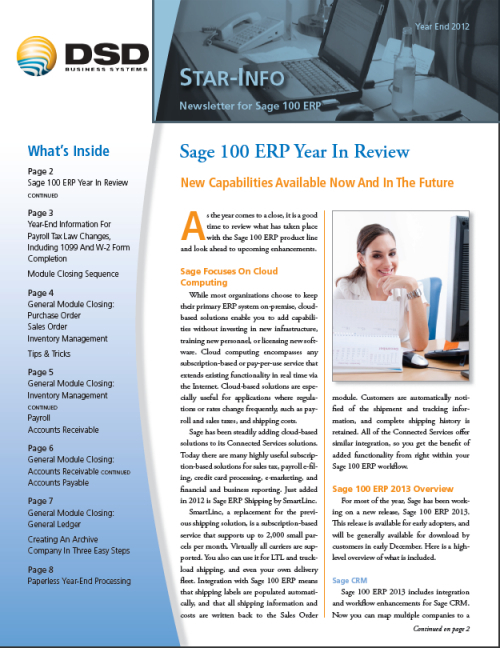 Our special year end newsletter for Sage 100 ERP (formerly known as MAS90 or MAS200) users is now available. In this issue we explore tips and tricks for closing every module – including the order in which they should be closed. Are you following best practices by creating year-end archive companies? If not – we will show you how to use the built-in features that allow Sage 100 ERP to quickly create backup copies of your live data. These copies of data are especially helpful for anyone using the payroll module since you can refer back to the archived companies throughout the year as your employees request copies of W2 and other forms which they may have lost. This issue also has information on the payroll tax updates and provides information about when and how to apply them to your system to meet new IRS and state tax guidelines. We’ve just received our year end MAS 90 and MAS 200 newsletter – 2011 edition. Whether you have been working with Sage ERP MAS 90 or MAS 200 as a novice or expert – there’s something for everyone in our year end newsletter. You can view the information online or click to download the newsletter. Sage North America have released their IRD (Interim Release Disk) which contain year end program changes for Accounts Payable and Payroll modules. These changes add functionality to the ERP system which allow for processing according to updated federal and state government regulations concerning 1099, W-2 and other tax forms. If you have installed the Product Update 3 for version 4.40 these changes have been included in the final released product. 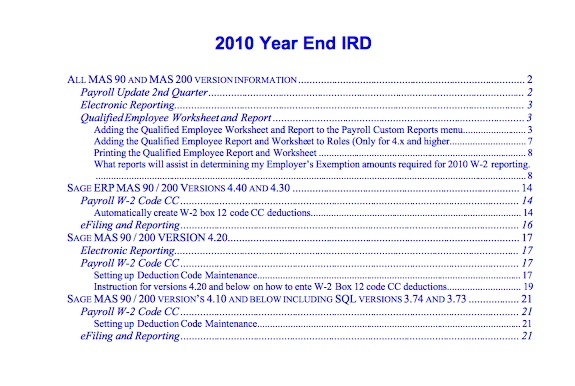 A download with payroll updates for Federal 941 2nd quarter 2010 was made available via the website. This payroll update included adding a new data table, program and form changes to adhere to the Federal requirements under the 2010 Hire Act used for reporting employer exemptions for qualified employees. If you have installed the Product Update 3 for version 4.40 these changes have been included in the final released product. Some changes included in the Payroll Update. Qualified (W-11) checkbox added to employee maintenance. Update and 941 program change logic. 2010 2nd QTR 941 form change logic. 1099 Electronic Reporting has been modified according to the Internal Revenue Service’s 2010 Publication 1220. W2 Electronic Reporting has been modified according to the SSA 2010 Specifications for Filing Form W-2 Electronically. A Qualified Employee Worksheet and Report has been installed to the reports directory. This report is a visual display of the PR_QExxx.soa table that was created to capture data for reporting of qualified employees. The report only displays for employees that have been selected as Qualified in employee maintenance. The amounts on this report do not reflect the FICA limits. The number of qualified employees per quarter is calculated at runtime. This number is not retained in a data file when printing the 941.